The dynamic business reality and success of the Studio Cristallini, a multi-brand clothing distributor, forced the owner to re-think the image of their Rome headquarter. For logistical reasons, the works for the three-level showroom refurbishment (ground, basement, and first floors) were executed in three different stages. The Silver Hall, at the ground floor, hosts the main entry, the administration and the director’s office. The Black Canvas, in the basement, accommodates the sale and display areas as well as a series of amenities. White Scenario, on the first floor, acts as a showroom and multipurpose space for product display. 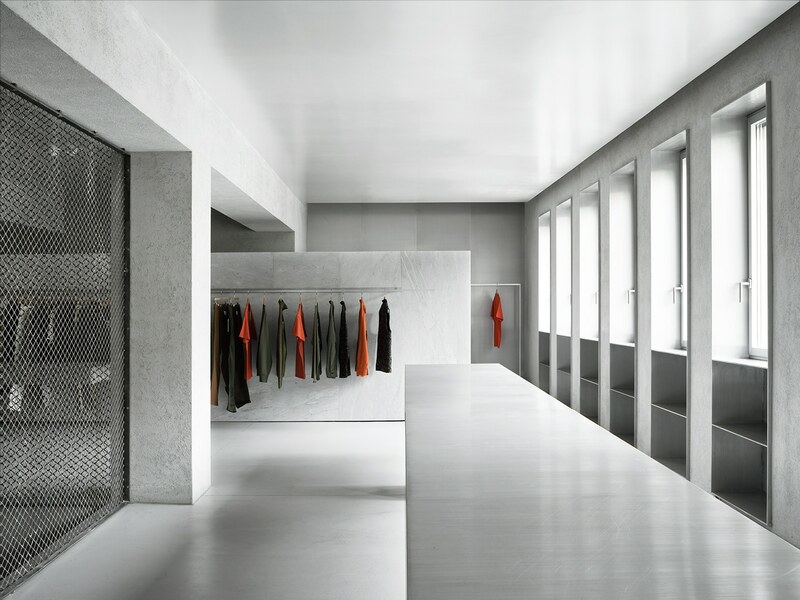 Designing a showroom where the clothes with their variety in form and colors are the main subjects, each floor is conceived as a monochrome atmosphere with achromatic backdrop colors chosen based on the presence or absence of natural light. The client requested an open space that could also provide privacy for both meetings and administrative areas. The existing space presented a fairly rational concrete structural grid; a row of central columns and a series of beams connecting them. The insertion of a secondary system of steel beams re-establishes a visual order, partitioning the space in eight regular bays. The layout unfolds within the established grid: one bay houses the entry, staircase, and indoor garden, three bays are occupied by the administrative area while two last are devoted to the director’s office. A soundproof glass wall divides the director’s office and meeting room from the rest of the space while the silver iridescent curtain can occasionally be used to visually conceal the office from the entrance. 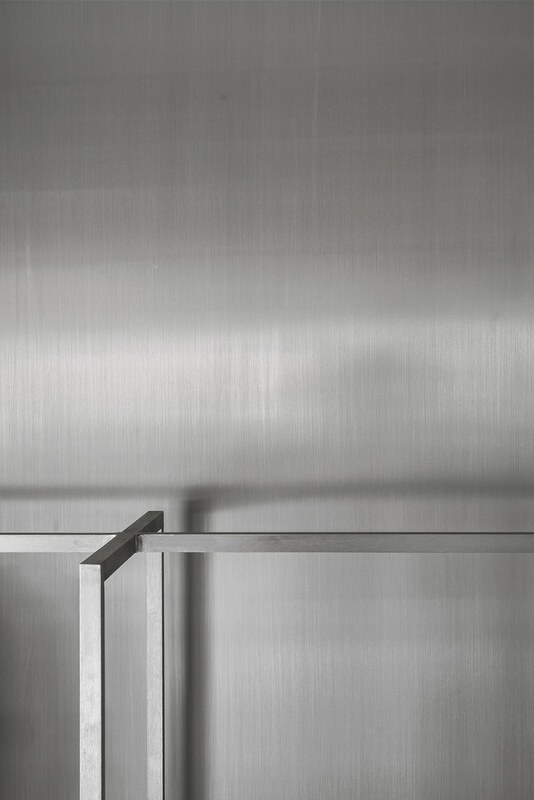 A long steel counter slides along three bays with a height of 1.25 m, concealing the administration area (when the staff are seated) without separating it from the open space. A spiral staircase with a rectangular plan and new skylight connects the three floors, providing both natural light in the back part of the space as well as for the hydroponic interior garden. The suspended hydroponic garden contrasts in softness and color with the sharpness of the design and its material palette of aluminum, steel and glass. 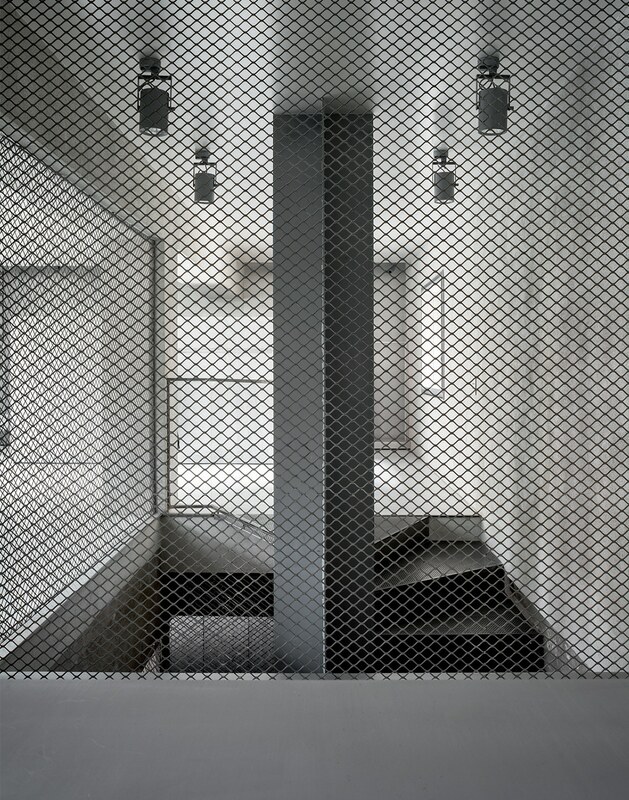 The natural light penetrates from the street facade, filtered by a translucent film. Made from subtly differing metals that vary in brightness with the surface angle of the light source, the hall is filled with shimmering silver light. The space takes different hues as the hours of a day pass by: from a sharp silvery co lour in the morning to a goldish and warm color in the evening. The second intervention on the basement presented three design challenges: the duality between an open and enclosed layout (selling and displaying different brands requires isolated space, however the sense of an open space was also a client requirement), the absence of natural light and, a limited time for the construction. The existing space is punctuated by a double row of concrete columns that divide the space into three naves. Within the central nave, eight display volumes are created. Each volume has a double entry, diagonally arranged along two sides. This guarantees visual connection with the main space without losing a sense of enclosure and exclusivity. The arrangement of these openings allows for the displays to be perceived as a sequence of separated volumes. Two passages interrupt this series of volumes, allowing the connection between the two lateral naves. Those are arranged as open space with displaying shelves. This open layout gives a market-like feeling to the space. The whole space is black with different surfaces acknowledging the absence of natural light: black stained timber on the floor; textured fibers on the new partition walls; burnished steel plates within the boxes; dark coating to the existing walls and the exposed service-ducts. Only the existing concrete columns are kept exposed in their materiality. The repetitive layout of the offices, the lightweight construction and the simplicity of the material palette generate a strong visual outcome and allowed for a quick construction timeline. The black canvas celebrates the colorful variety of the clothes as well as the presence of people wondering within this modern souq-like maze. The third and final intervention for this project is located on the first floor. An “L” shape former apartment is converted in a showroom and multipurpose space for product presentation. A long facade punctuated by a rhythm of openings towards the external plaza brings a play of natural light to the space. Two partitions clad in finely sanded Carrara marble are the only fixed elements that articulate the space, these provide for private areas in an otherwise continuous space. Floating within the space are also two long aluminum tables in split modules that can be removed or rearranged in the event of a presentation. The remaining part of the program, clothing display and service area, is arranged along the existing internal perimeter walls. Along the external perimeter the openings are articulated by aluminum frames adding additional shelving to the space and occasionally concealed by meringue-like curtains. The existing concrete structure is plastered with a textured render, which is the only exception to an otherwise smooth material palette. This palette plays with the natural light through subtle reflections and smooth surfaces: pale grey concrete floor; reflective ceilings, aluminum and white marble. Following the previous intervention, the White Scenario generates a monochrome white atmosphere, a background that reflects and scatters the natural light, enhancing the clothes and their colors.